cookies | Blog, Jane! Blog! A classic cookie! I bought some last weekend when Maria and I spent the day with her cousins at the pumpkin patch. And I definitely got a taste that I wanted more of, so I made them. I just used the classic Betty Crocker recipe. This is probably one of the first recipes I ever learned to make growing up… I’m pretty sure I entered them for 4-H at the County Fair at some point. Very easy, and so yummy! Hard to mess up! In early December, Nicole, Heather, and I got together to do some holiday baking. I mixed up this recipe, and then stuck the dough in the freezer. I just thawed the dough the other day in the fridge, and baked them tonight! Super yummy, and I still have another roll of the dough in the freezer! The only change I made was using dried cranberries instead of fresh or frozen. Today is my brother’s birthday. Usually I am the cake maker, but since we won’t see them until Christmas Day. I just decided to make him his favorite cookies to take home. My Grandma used to make Molasses Cookies and my brother loved them. So when I found this recipe, I had to see if they were as good as Grandma’s. I don’t know if they are, but they are excellent! A keeper, unless someone has Grandma’s recipe! This morning, I was looking to bake. I had some cinnamon chips (made by Hershey, I’ve found them at Cub and at SuperTarget) and some apples. 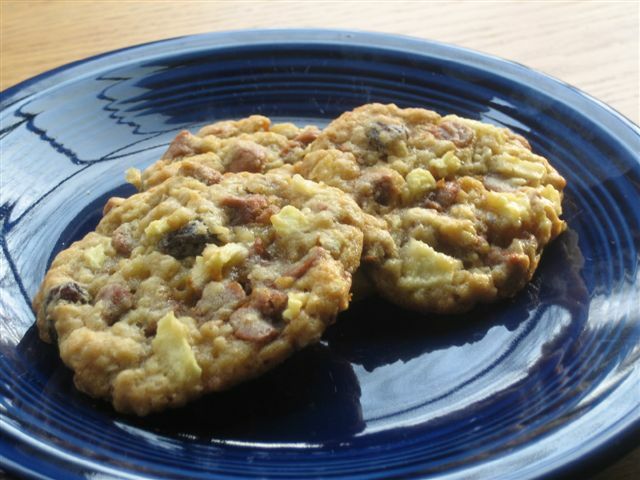 I figured there had to be someway I could combine them… I found a recipe for Cinnamon Chip Apple Cookies… Super yummy! Some of the best cookies I’ve ever had!